The Eurofighter is one of worlds most advanced fighter jet. This 2-engine, supersonic canard aircraft has been developed by the United-Kingdom, Germany, Spain and Italy. The Eurofighter will replace the jaguar and Tornado (UK), Mirage F1 (Spain), F-104 Starfighter (Italy) and the F-4F, MiG-29 (Germany). The production is divided into tranche 1, tranche 2, tranche 3A en tranche 3B Eurofighters. The tranche 1 can only perform air-to-air missions, the tranche 2 and tranche 3 version are multi-role versions. The last tranche 1 aircraft for the United-Kingdom have been modified to perform limited air-to-ground missions. This to fill the gap with the former jaguar aircraft. The first successful test with short range air-to-ground ammunition was successfully completed in 2007. The Eurofighter is an important fighter for Europe. The aircraft is excellent as a air defence jet and will be a big threat for the most modern Sukhoi fighter jets (Su-35 and Su-37). 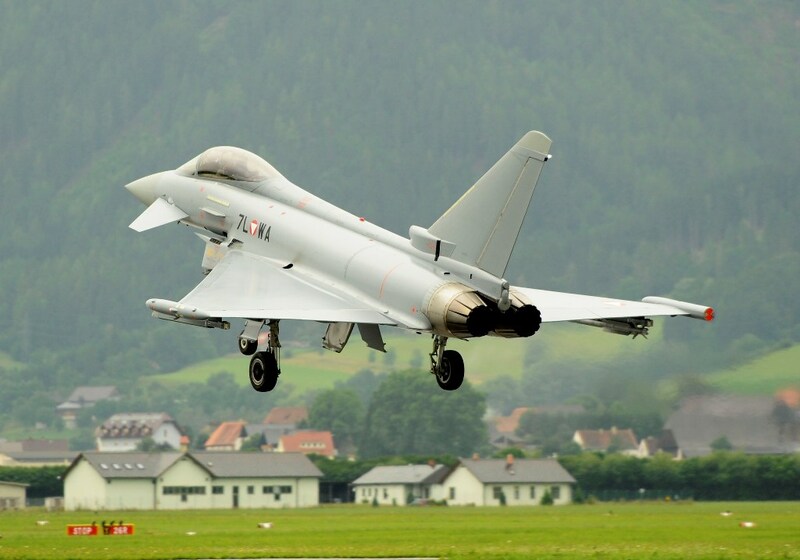 Along with the US F-22A Raptor, the eurofighter comes in service by the large air forces of Europe which are part of NATO. It will serve for many years as a very advanced air defence jet. It is a extremely maneuverable jet thanks to the canard wings, superior aerodynamics and high thrust-to-weight engines. For the secondary role, air-to-surface, the tranche 2 version will be developed but it is not sure if this version will be even advanced as the US F-35A which is primary developed for air-to-ground missions. However the Eurofighter will be along with the French Rafale a very important fighter jet for the air defence of Europe. The production of the aircraft is done by EADS Military Aircraft (Germany) BAE Systems (UK), Alenia Aeronautica (Italy) 19.5% and EADS CASA (Spain). The order for the delivery of 620 airplanes was signed in 1998. The fighter jets are still being delivered to the 4 nations. Alenia Aeronautica is in charge of final assembly for the 121 Italian aircraft. They have responsibilities of the design and manufacturing of left wing, rear fuselage, wing pylons and the System Design of the navigation, armament, utility control, propulsion, secondary power systems for all aircraft. The eurofighters have PSP2 Capability (Production System Package) with Initial Defensive Aids Subsystem (DASS), Multifunctional Information and Distribution System (MIDS), Initial Direct Voice Input (DVI) and Sensor Fusion. The systems of the eurofighter are very advanced. The aircraft has a long-range radar, infra-Red search and track system, air-to-air missiles for short and medium-range distances. 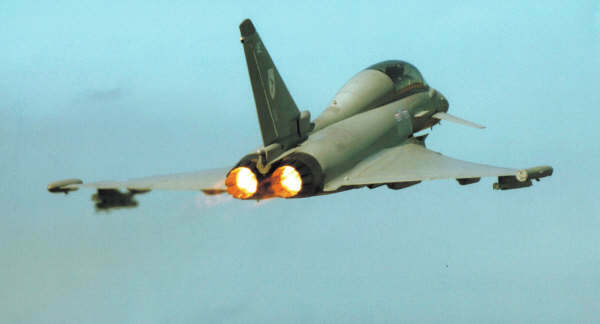 Originally the tranche 1 eurofighters were only be able to carry air-to-air weapons, The last batch of Tranche 1 aircraft have a limited air-to-surface capacity. All other production aircraft will be updated to this last Tranche 1 standard. The Tranche 2 standard will have full air-to-air and air-to-ground capacity. Into the advanced cockpit, the pilot can talk to the aircraft by a ''direct voice input'' system. The pilot looks to three color displays and has a covered view of the weapon control panel. The 2 engines deliver 40.000 pounds thrust and the maximum speed is about 2125 km/h (on altitude and without payload). In 2004 the United-Kingdom has flown with 2 airplanes to Singapore for evaluation by the Singapore Air Force. Germany has divided the Tranche 3 version into a Tranche 3A (31 aircraft) and 3B version (37 aircraft). In 1995, Germany decided to reduce the original planned aircraft to 140. Some years later, 40 more aircraft were ordered. Germany will still receive 180 Eurofighters. In December 2009 the Germany Ministry announced that it will sell its 37 Tranche 3B aircraft. The Italian eurofighters have seen operational during the Olympic Games 2006 in Italy. They (and lots of more Italian military aircrafts) were used for surveillance. 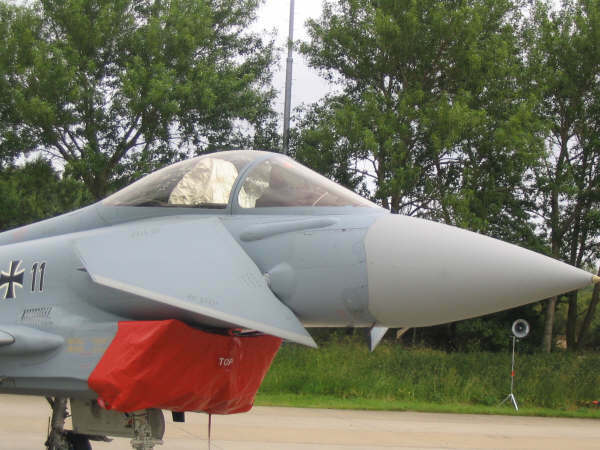 Austria has bought 15 Eurofighters from Tranche 2. The first of this aircraft has already been been delivered. Austria should bought 24 aircraft earlier but that was reduced to 18 and is now being reduced to 15. 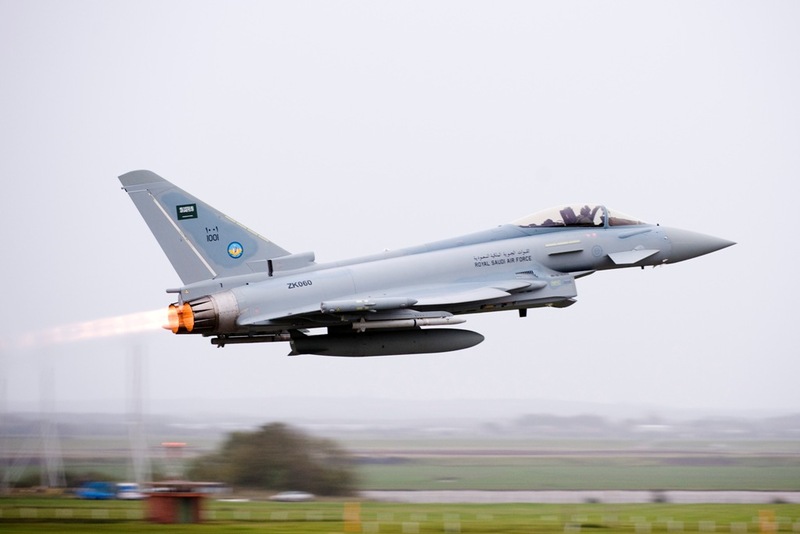 The Air Force of Saudi-Arabia has ordered 72 Eurofighter Typhoons. In 2012 the Air Force of Oman ordered 12 Eurofighters Tranch III. Greece was interested to purchase 60 airplanes but delayed. The Eurofighter consortium is in the running to supply India with 126 Eurofighters.